It's unfortunate, but there are a lot scammers out there looking to steal personal and financial information from Android devices. But don't fret, we're here to help you stay safe. These are the Android scams you should know about and how you can avoid getting caught in them. Prize scams have been around for a long time. They were traditional landlines but have moved to the web and now to smartphones. They follow this very basic concept: we get excited when we find out we won something and are then susceptible to scammers. Here are some things you need to watch out for. One sign that you are getting involved in a prize scam is you have to pay the representative money in order to win or to increase your odds. According to the Federal Trade Commission, it is illegal for anyone to request payment for you to enter into a contest or increase your chances of winning. Basically, if you have to pay, then it's a scam. If you get a text message that claims you won a gift or other prize then you need to ignore it. These include offers of trial periods for software or samples of food and medication. Don't tap on anything when you see this and be sure that you erase the message. Remember that most likely you won't get something for free in general. What company or person is just handing out gifts and prizes left and right? There's no such thing as a free lunch. There is a lot money to be made in new apps and software programs. There are plenty of investment opportunities out there but unfortunately there are also plenty of scams too. You need to be discerning about who you invest in and through. But don't fret, there are some ways to keep away from fishy investments. The first thing you need to know is that great investment opportunities don't come knocking at your door. Meaning, you need to do thorough research to find good investments. If you receive an email, text message or see a link that claims you've fallen into an investment with huge returns then it's probably a scam. The second thing you need to watch out for is some of the crappy investment mediums out there. If you find a crowdfunding site with promises of ridiculous returns then be wary. I'm all for trying out new apps and sites but when it comes to investment it might be best to stick with the established crowdfunding sites like Kickstarter. Phishing scams use deceiving messages to entice you to provide personal information to thieves. This could include financial details, phone numbers, addresses, social security numbers, birth dates and more. How a text message phishing scam works is a message comes from what seems like a legitimate institution like a bank, government agency, insurance company, etc. The scammers first try to gain your confidence so they probably won't ask for personal information right away. Usually you'll be redirected. One text phishing scams is a trickster tells you that your bank account has been stolen and needs to be verified. The message then prompts you input bank login details, personal information or a PIN into a link they provide. Once inputted, your information is stolen. You can avoid this scam by never trusting a text message from an unknown source. Even if a message looks legitimate it should still be verified before any action is taken. If it's from a bank just pick up the phone can call them directly. Then you'll know for sure. Cyber thieves are creating apps which look and function like legitimate apps but are actually malware that steals personal or financial information, tracks locations and communicates with contacts and scams them as well. This doesn't just happen with APKs. Some of these apps can be found in Google Play. Fishy APKs are pretty well known and can be avoided by ensuring they're always download from a reliable source. Check out our APK file guide to make sure you're safe. There are also plenty of apps in Google Play that are there to scam Android owners. Make sure you check the app's permissions and don't trust all reviews. 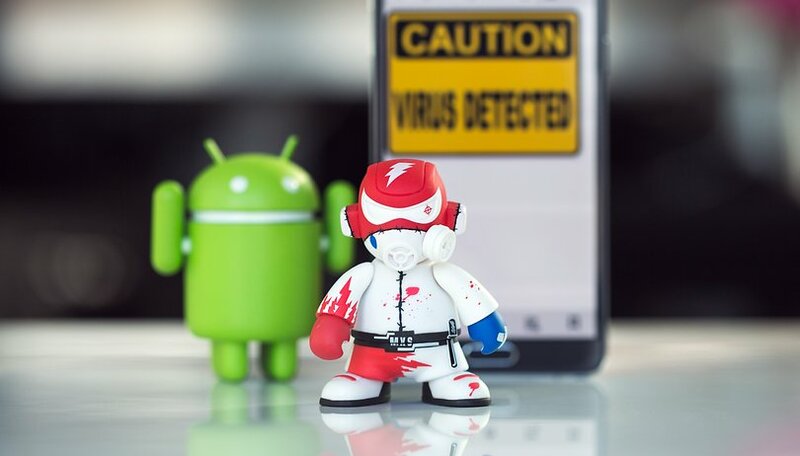 You can avoid APK malware by ensuring you always download from a reliable source. One recent scam was the 'exclusive' version of WhatsApp dubbed 'WhatsApp Gold'. This is fake and when it's downloaded your phone is immediately infected with malware. There are other WhatsApp scams out there too like 'WhatsApp Plus'. Only download the updates from WhatsApp itself and don't trust any upgrades. Tech support or 'high-tech' scams have been around since the late 90s. They started out with desktops and have since moved to smartphones. What happens is a call from someone who says they are the tech support for your service provider or device manufacturer. This person then tried to elicit personal information. One of the biggest tech support scams is the 'ransomware' scam. The 'tech support' person claims your device has been infected with a virus and they are there to help you but only if you pay for the service first. Then they attempt to get you to make a purchase through a phony site or just ask for credit card details over the phone. Whenever you receive a message or call from someone who claims to be there to help, be cautious. If your phone was compromised a legitimate provider would not use that device to solve the issue. If you get one of these calls, hang up, and call your service provider from the number on the website. Not all Android device repair shops are created equal. Some of them are owned or staffed by thieves. If you bring your phone into one of these disreputable establishments your data can be stolen or hardware switched out for worse equipment. One of the most common violations of data privacy with scam repair shops is when they break into a device. This does not always mean they steal data but it nevertheless is not desired. If you bring a device in to get the battery or screen repaired don't assume the shop will not get into your phone. Even the most encrypted screen lock will not help because they can bypass this. If you need a repair be sure to shop around before settling. And the chain places aren't always better. There could be a rogue employee there. Your data is not safe even at trusted establishments and any sensitive information should be scrubbed before bringing in your Android device. If you find one of these scams then be sure to report them to the Federal Trade Commission immediately and they will investigate. Do you know of any more Android scams? Let us know in the comments. I recently began to get messages when I turn on my cellphone purportedly from Google stating that there has been a change to my Google account and for security to sign in again. Is this legit or a phishing scam? I'm new to this site. I've very happy it just landed in my hand because the whole phone,apps,wifi thing has me on edge non stop. I feel like I never know anymore if my apps are real, my Facebook is hacked, calls rerouted. I've been through pure hell the past going on a year now with my phone/phones being tampered with. It has caused me to find myself pretty much non stop going through my phone going through all files websharching every app file I see. Am I just over paranoid? The area I live in is known for phone hacking. Duplicating apps, mirroring phones, operating someone else's phone from their phone, rerouting calls. I'm constantly factory resetting my phone, I refuse to turn my Wifi on or my mobile Hotspot. I know it sounds nuts and I even worse sound a little crazy, but the intelligence people have and use to make all I said true is very wrongfully brilliant,a nerve wrecking. Sorry to go on and on. Please if anyone has more tips I'll be sure to soak it all in. Thank you so much. Android needs to do something anything to police its own system, I only get apps from the Play store. Yet I have constant pop ups, especially from UBER which I have never even viewed on the play store and browser pop ups informing me that I have viruses from visiting adult sites, WHICH I DON'T VISIT, it would be at least passable if the pop up page had passable English. Android is just frustrating. It would be nice if they actually did something about this. I've been getting the text message one a lot lately. I just delete it. Except once I thought it was a scam text, and turns out it was a DHL shipment from an order. I think this list should have The Virus has Infected Your[.......] Scam. They usually happen when you're entering a dangerous website and then suddenly there's a prompt with a message on your screen saying *for example*: Warning, a virus has infected your Android OS and attacking your battery please install *This App* to get rid of this virus. Sometimes they bring you to Google Play Store and sometimes another website, sometimes the app is malicious and sometimes it's a dumb way for the developers of the app to trick you to download their app. The ONLY way to avoid this scam is when you're prompted a message similar or different but still says "download this app" like above EXIT the website. Agreed, and yet the pop up page has extremely poor English, "We have detect..." Detected arrggghhhh why not just post on the page that you are trying t rip us off. I hear you sir, I share your frustration. I'd add to the list a new ROM scam. Now, when everybody (well, almost everybody) strives for a Marshmallow updates, there are numerous sites proposing to download a new MM ROM for a rooted phone. Sometimes it is a phony site following by redirection to even worse sites with a lot of malware. XDA is one of trusted places, but some others are not. I have a question, what should one do if you stumble upon these pop-up ads that make your phone vibrate once and it doesn't let you go back or close it? Does the phone already get infected or...? no it doesnt get infected. Just close your browser right away. Also, make sure you're looking at safe sites (get my meaning?). Like Grim said close your browser or hit the back page on your phone and cancel the page. JUST DON'T HIT ANYTHING ON THE PAGE. Both of these are good ones to watch out for. Thank you! I'm very afraid of someone running away with the phone. I tell people that want to use my phone, "sorry, can't, the battery is almost dead." they leave me alone. This same thing has happened to me. For some reason I had a bunch of themes and emojis that I never installed show up in my gallery.